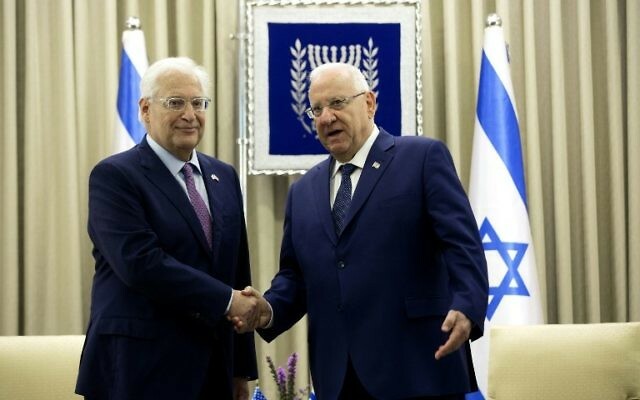 David Friedman on Tuesday presented his letter of credence to President Reuven Rivlin, officially taking up his post as US ambassador to Israel. “As you know, the [US] president [Donald Trump] has chosen Israel as the site for his first international visit. His love for and commitment to the State of Israel is rock-solid and it enjoys his highest priority,” Friedman said during a ceremony at the President’s Residence in Jerusalem. “Serving the US as its ambassador to the State of Israel is the greatest honor of my life, and I pledge to you to do all that I can to strengthen and enhance the relations between our two great nations that you accurately described as unbreakable and, I would add, without limits,” the new ambassador said. “I’m so grateful to President Trump for giving me the opportunity and for having confidence in my abilities, and, most importantly, for sending me off this past week with the unequivocal and unambiguous mandate to support the State of Israel in every way, and in all ways,” he said. Israel’s Channel 2 reported that when the Israeli national anthem was played at the ceremony, Friedman initially murmured along — “familiar habit” from years of Israel events, said the TV reporter — before realizing that this might not be appropriate. Friedman, an observant Jew from Long Island, New York, landed with his wife and daughter at Ben Gurion Airport Monday afternoon and headed directly to the Western Wall in Jerusalem’s Old City. His arrival came amid ongoing speculation over the US administration’s intention to move the embassy from Tel Aviv to Jerusalem. Rivlin welcomed Friedman to the city, which he noted is “the capital of the State of Israel,” and called on the US to fully recognize Israel’s sovereignty over the city. During his election campaign, Trump vowed emphatically to move the US Embassy from Tel Aviv to Jerusalem, an act that would have been seen as tacit recognition of Israeli sovereignty over the city. But that plan has since been put on the back burner, and US Secretary of State Rex Tillerson said Sunday that the president was still weighing whether such a move would help or hurt his efforts to relaunch Israeli-Palestinian peace talks. Friedman, who owns an apartment in Jerusalem, will work out of the Tel Aviv embassy and live at the ambassador’s official residence in Herzliya. In addition, he will use an office at the King David Hotel in West Jerusalem, as many of his predecessors have. Rivlin hailed Trump’s decision to come to Israel next week. “His visit is very important. 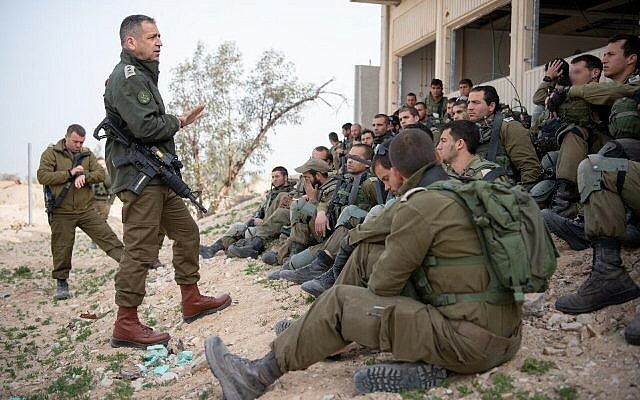 It is a sign of the unbreakable bond between Israel and the USA,” he said. “We look forward to working with the new administration to find new ways and to think of new ideas for how to move forward and build trust between Israelis and Palestinians,” the president went on. He then praised the US administration for taking military action against the Syrian regime. “You showed that red lines cannot be crossed. The whole free world has a duty to the Syrian people, to end the humanitarian nightmare,” he said. Friedman’s arrival comes amid an unusual diplomatic spat between US and Israeli officials surrounding Trump’s planned visit to the Western Wall next week. In response, the Prime Minister’s Office said it believed the comments do not represent the president’s position, an assertion confirmed by a senior Trump administration officials hours later. “The comments about the Western Wall were not authorized communication and they do not represent the position of the United States and certainly not of the president,” the official told The Times of Israel. Later on Tuesday, the new US ambassador was expected to hold his first meeting with Netanyahu in his Jerusalem office.